This pattern is designed by Donna Vermillion Giampa and is in leaftet number 71 published by Sudberry House. 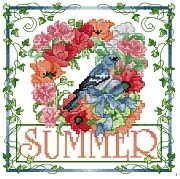 This pattern displays Summer Flowers and colors on display in a wreath along with a yellow bird. This pattern includes Full stitches, Quarter Stitches and Backstitching. With Supplies: $33.54 You download the design. We will send you, 34 skeins of DMC Floss & Wichelt 14ct. 18" x 21" Aida (White) to complete your project.